Dreamforce 2012 took place at The Moscone Center located in the heart of San Francisco’s SoMa district. 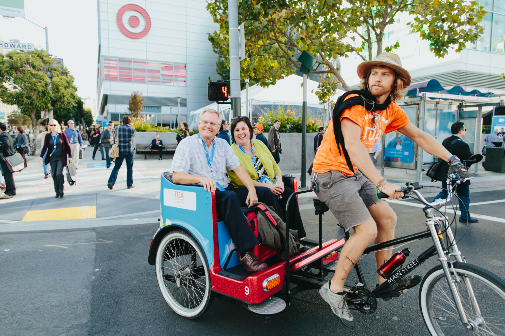 The pedicabs operated around all sides of the Moscone center and also provided rides around restaurant and hotel areas where many attendees stayed and dined during the event. A total of 40 pedicabs established a very heavy presence around the entire convention center for this event. 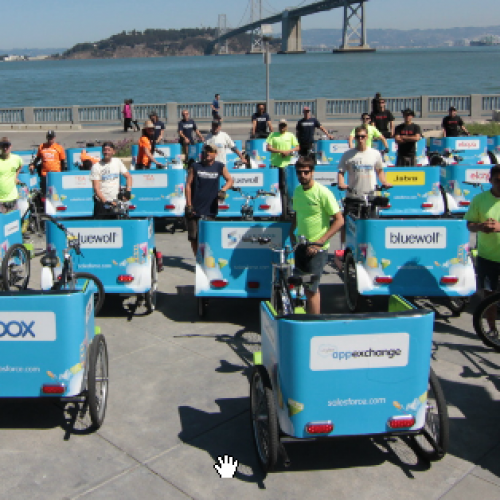 Eight different sponsors (Eloqua, Box, Jabra, Blue Wolf, TOA, Capgemini, Appexchange and Silverpop) along with Salesforce Co-branded pedicabs with their respective logo and the drivers donned branded T-shirts to correspond. As attendees exited the pedicab after a ride, they were invited to visit the sponsor’s booth and were also given sponsor’s marketing collateral. 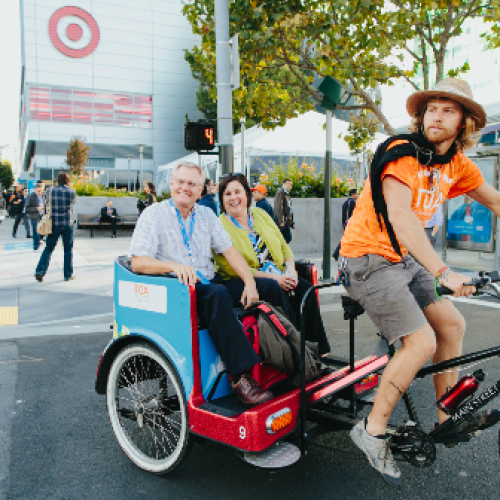 The campaign ran from, 9/18-9/21, with 40 fully wrapped pedicabs, complimentary rides were given, drivers were branded and also acted as Brand Ambassadors for the sponsors of the event. There was a total of 1,320 man hours, over 6,000 rides given and over 9,000 passengers. Many passengers told drivers how they never thought of a pedicab as a way to mobilize quickly, rather as a novelty or tourist attraction. After struggling to find a taxi, and realizing that it was a complimentary service, they would jump in and quickly find out that not only was it fun, but fast as well.